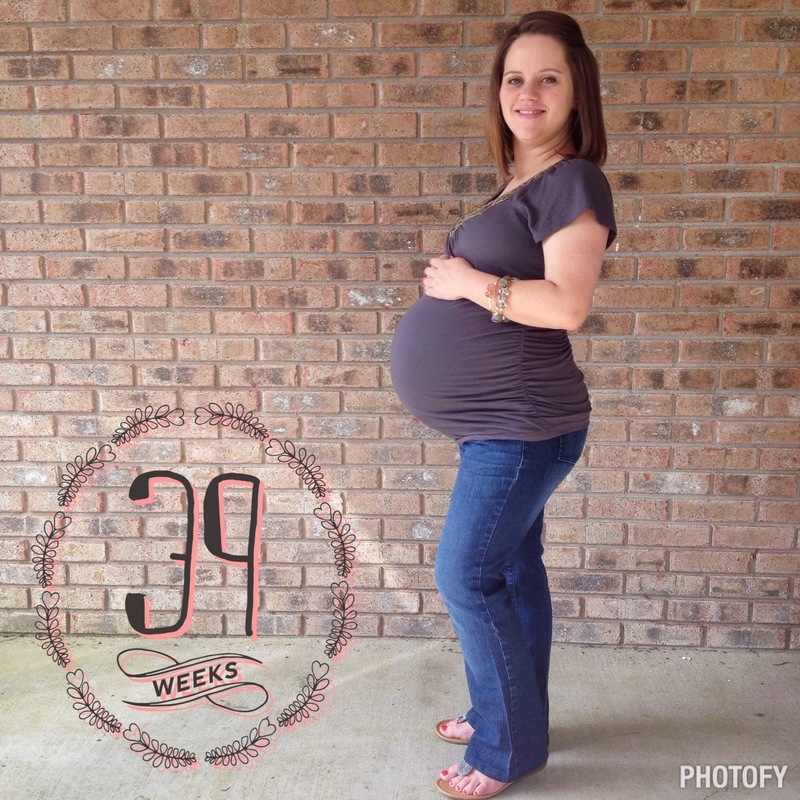 Me at 39 weeks. She was born at 39 weeks 5 days. You can read Lucas’ here. I was awoken by a loud pop and gurgling bubbles sound that I could feel. I laid there for a second with my eyes opened and realized that” Oh No! That was my water, get to the toilet!” So I jumped out of bed, and almost made it to the toilet. It was almost 8 am. I called Clint at work and told him to come home and called my midwife to let her know. I also called my mother-in-law and asked her to come get Lucas, who was still sleeping. When she arrived, I decided to jump into the shower since I cannot function without my morning shower. About 9 am, I started having some contractions here and there but nothing to be timed. Clint got home shortly after and contractions started very quickly and were STRONG! I hadn’t expected things to get so serious so fast, because they hadn’t with Lucas. 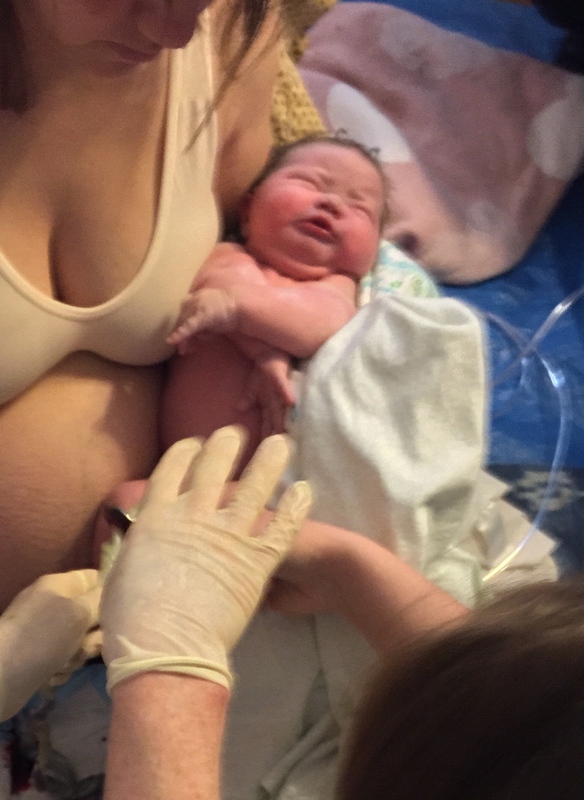 .I expected a build up… By about 10 am contractions were 2.5 minutes apart and 50 seconds long and about a 7 or 8 in pain. Michelle and Lucas left about this time. By 10:30 they were 3.5 minutes apart but were 70 seconds long now. I was in the shower again at this point because I was having a pretty hard time dealing with the contractions. Clint and I couldn’t figure out a good way for me to “make it” through my contractions. With Lucas, I would put my hands against the counter and sway while Clint did counterpressure on my back or something along those lines. But I had back labor with Lucas, and that didn’t really work this time. And these contractions were MUCH stronger. It was about this time that we all decided my midwife should start heading our way since she lives an hour from us. My little sister, Shaye, arrived around this time. Clint and I had been trying different things to help me cope with the contractions. Hip squeezes worked every now and then, counterpressure on my back worked some, but for the most part we figured that if he would just squeeze my upper body and I squeezed him that felt the best. It just made me feel secure, I suppose. I had LOTS of pressure with each contraction on my bottom and figured out that a towel between my legs serving as a bit of counterpressure was also relieving. I have no idea why. This made me decide to sit on my exercise ball. I tried to stay moving and keep my mind off the contractions, but it was pretty difficult during them. At least I didn’t really need to time them anymore, THAT was extremely annoying to me for some reason. Once on the ball, I started feeling pretty “pushy” with every contraction. It was about 11:50 now and we were starting to worry since my midwife wasn’t there yet. Shaye called her and she was right down the road, so we all relaxed a little. She did tell me to get off the birth ball though and the pressure would be less. I decided to lay down on the couch for a little while so Clint could squeeze me through my contractions and I was hoping maybe I could get one of those “breaks” I had been praying for. Silly me. My midwife checked me at 12:08 and I was around 6-7 cms and 90% effaced. That was great news to me! Things seemed like they were happening so quickly. Because we needed to fill the birth pool with warm water, it still wasn’t full. We were filling it with hot water and then when it was close to the level we wanted, we were going to fill it the rest of the way with cold water so it would get warm. But the hot water heater runs out of water so you have to let it refill. I got really whiny about this time and promised Clint that this was our last and kept letting everyone in the room know that this was in fact our last child. Those “pushy” contractions started up and were pretty intense. Since I wasn’t fully dilated, I was trying to breathe through them. Then, suddenly I had a contraction that was definitely my body pushing involuntarily. My miwdife checked me again (12:45 pm) and I was fully effaced and was fully dilated except for a little lip of cervix. The pool was ready now, so I got into it and it felt amazing. I hadn’t really enjoyed the pool with Lucas’ labor, so I was very happy that it was so nice this time around. The only bad part is I am REALLY hot during labor so I kept asking for cold rags. Eventually, Shaye put lots of wet dish towels in the freezer and would just bring me a new one when I requested. I started pushing pretty much immediately and pushed leaning forward for a little while holding onto Clint’s hands and then reclined while also holding onto Clint’s hands. Pretty quickly, everyone in the room was commenting on all of her hair. She does have LOTS! 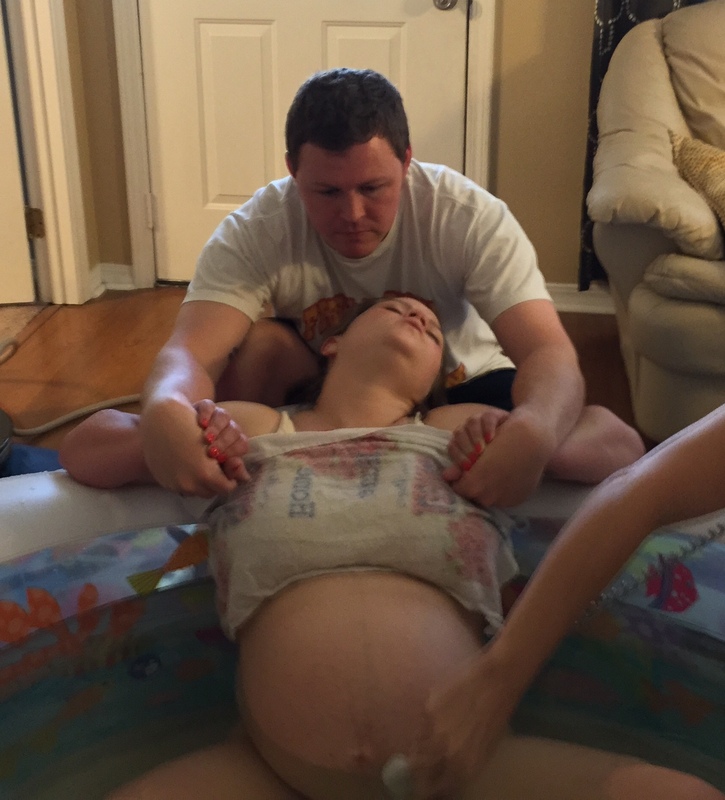 At 1:12 pm I got out of the pool because my midwife was concerned about shoulder dystocia. We did have a shoulder dystocia so I didn’t get to catch Harper like I had hoped to and did with Lucas, but my midwife handled it beautifully and Harper was born at 1:19 pm weighing a whopping 9 lbs 3 oz! And here’s Daddy weighing Harper. 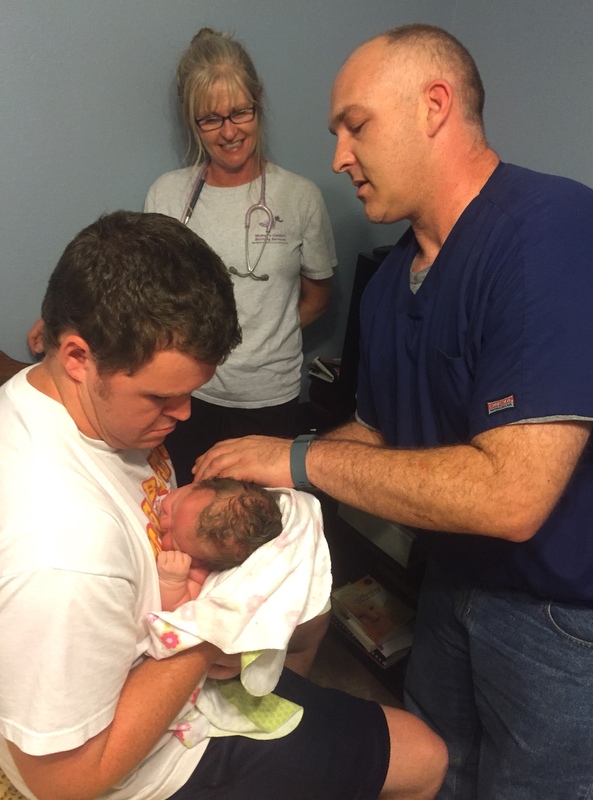 Because of the shoulder dystocia, our amazing chiropractor came by the house and adjusted Harper shortly after she was born. We could not believe she was so big! I am only 4’10” and Lucas weighed 6 lbs 5 oz, so baby sister is quite a bit bigger than he was. It’s kind of cool that I’ve had a baby in our bedroom and living room now. haha! Of course, both of my births will be something I remember for the rest of my life. Even with their challenges, I enjoyed both of them so much. For me, having a child with no drugs in my system in the serenity of my own home is EXTREMELY empowering. 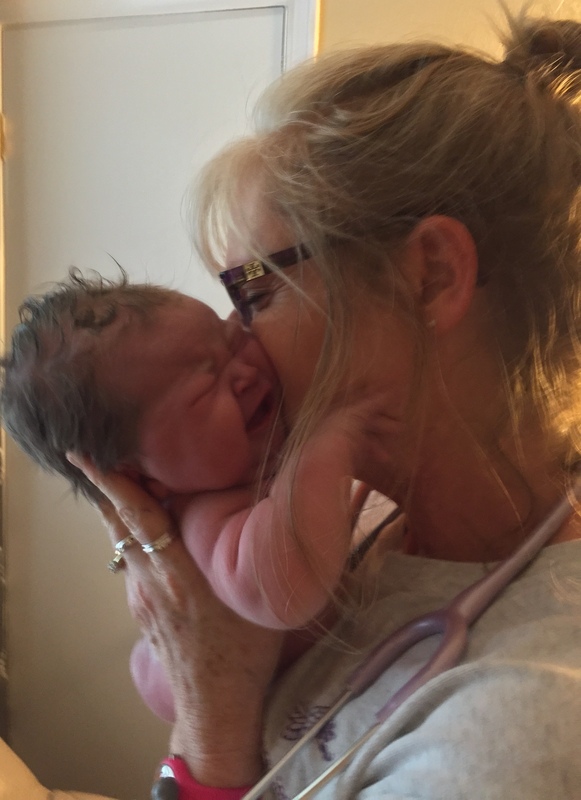 And I was so blessed to do it twice with a midwife who I completely trust and adore. Do you look back at your births with pride? What was your favorite part?